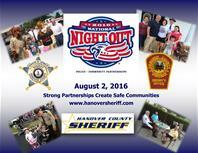 Hanover, VA- The time has come to start planning for the National Night Out 2016 in Hanover County. The date for National Night Out is Tuesday August 2, 2016. National Night Out is an annual event designed to strengthen our communities by encouraging neighborhoods to engage in stronger relationships with each other and with their local law enforcement partners. The goal is to heighten crime-prevention awareness, build support and participation in local anti-crime programs, and most importantly, send a message that our neighborhoods are organized and fighting back. It’s also the perfect opportunity to get to know your neighbors even better. In 2015, Hanover County ranked 20th in the nation of communities of a similar size. Another excellent example of the partnership between the Hanover County Sheriff’s Office and the community we serve. If your community is planning to have an event on this night to celebrate National Night Out, or you would like more information about National Night Out, please contact Deputy Barry Bland at 804-365-7116 or by email at [email protected] by July 26, 2016 so that we can make plans to stop by and thank the community for their support in keeping our communities safe.